"This sandwich is called a 'Media Noche' which translates to 'Midnight.' It makes a wonderful dinner sandwich because it is served hot. A nice side dish is black bean soup or black beans and rice, and plantain chips." 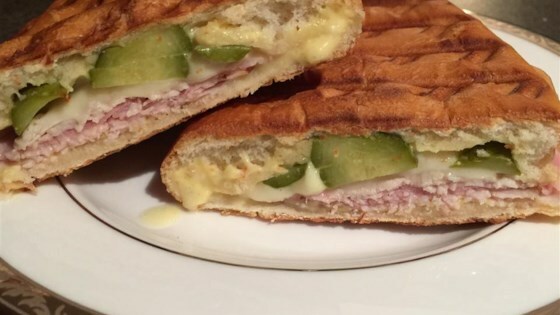 Hot ham and cheese, Cuban-style! good flavor. quick to put together and cook. i used the george foreman grill -- i cooked them for 4 minutes, making sure to apply some pressure to the handle of the grill and press the sandwich. more like a reuben without the sauerkraut. my husband is part cuban and from key west florida and i wouldn't try to pass this off as a cuban sandwich. These were great. However we had way too much sauce so you really only need to make half as much as it calls for.